Top precision model with density resolution of 4 decimal places for both Solid and Liquid. Suitable for plastic pellets, films, rubbers , fabric, advanced materials, and liquid density in the field of medical, food, and chemical that require accuracy. Minimum density and volume resolution 0.0001g/cm3. 4 modes for time measurement. Error tolerance can be shown. 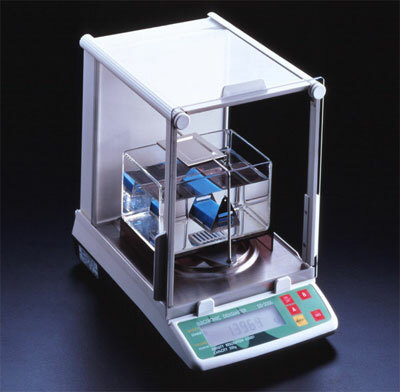 Able to measure the rate change of density and volume. One push operation to change Solid to Liquid mode. Only 20 seconds is needed to complete a test. Only 50cc of liquid sample is needed for testing.